We manufacture & export an organic certified Spa Body Scrub of 99.05% natural origin. The scrub is enriched with minerals from the Dead Sea. 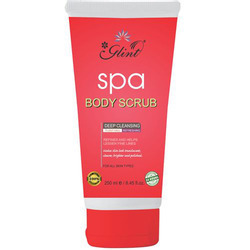 Gently massage the scrub in a circular motion until skin peeling is achieved and then rinse off with warm water. Suitable for all skin types. We are engaged in offering Swedish Spa Exfoliating Body Scrub. In order to meet excellent quality standards, we are supplying Spa Scrub. It was said to be Queen of the Nile's bathing ritual. And most people till today swear by the abrasive benefits of a salt scrub. It can buff away dead skin and add a glow to it.Brides include it in their runup-to-the-big-day regimen and there is every reason why you should also make it your weekend go-to skin fix. We are manufacturing and supplying wide assort of Exfoliating Scrub for Spa. These offered range are highly appreciated by our client's in the market due to their long life and super quality. Moreover, we are offering our range in minimum price. This salt scrub is inspired by African tribal spa rituals. It moisturises as it exfoliates. Removes Dead Skin Cells and restores natural exfoliation cycle. After cleansing , apply LEEYA PEARL GLOW SCRUB and massage for 5-8 minutes from neck to face in circular movements then rinse off with normal water. Description: This deluxe ‘facial’ for the hands and feet is the ultimate restorative treatment for pampering. Finished off with a smoothing, hydrating, firming mask, your skin is left radiant and glowing – your mind calm and your body absolutely relaxed. Gives instantly glowing & radiant skin, removes dead skin & extra oil from skin for a perfect look for any occasion. Our reputed entity is engaged in supplying Swedish Spa Smoothing Face Scrub. From our wide consignment, we are affianced in supplying Vedic Line Foot Spa Scrub With Menthol.